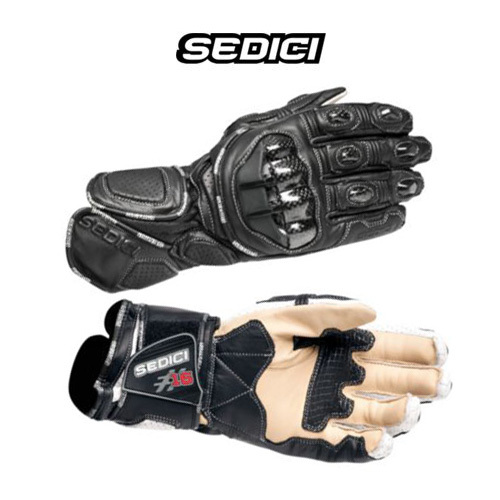 Last summer I was browsing through the gloves at Cycle Gear, and slipped my hands inside a pair of Sedici Ultimo Race Gloves. Oh. Em. Gee. I couldn’t believe how comfortable they were. They cost more than I ever thought I would pay for gloves, but how quickly the mind changes. I’m now in my second season of riding with them. How have they stood the test of time? Well, that sounds good. Good enough to justify the $65 purchase price. (Regular price is $80, but they are frequently discounted by 20%, so watch for a sale if you’re interested.) So, what do we get for our 65 smackeroos? I find the fit to be spot on. I got a size medium and–pardon the pun–it fits like a glove. Having two velcro cuff straps seems a little strange, but it actually works nicely to really secure the cuff to your arm. I can also appreciate that the double closure might help keep the gloves on you if you went sliding down the highway. The fingers are just the right length for my hands–no pinching and no bunching up at the fingertips. The velcro strap that cinches across the wrist is a bit too long. Because of the location where it crosses my wrist, it can be uncomfortable if I get it too tight. 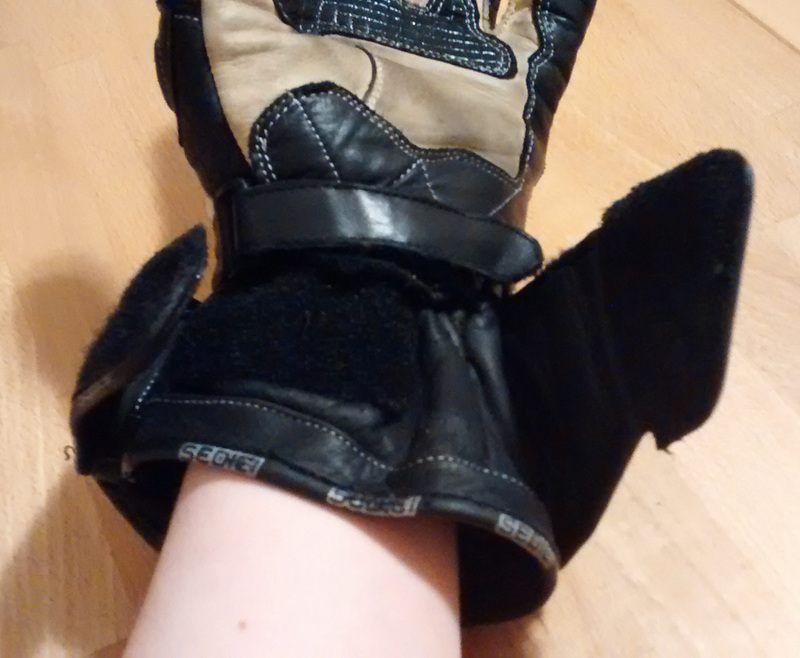 It does help to make the glove fit a bit more snugly, however. Once I have it cinched in the right place, I rarely need to adjust it. 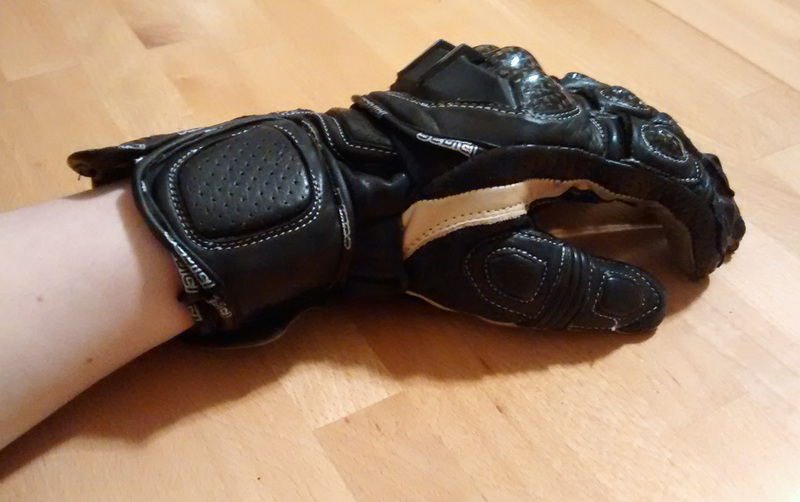 At first I didn’t like how disconnected I felt from the throttle because the leather was stiff; however, a few days of wear and the leather became more flexible and comfortable. 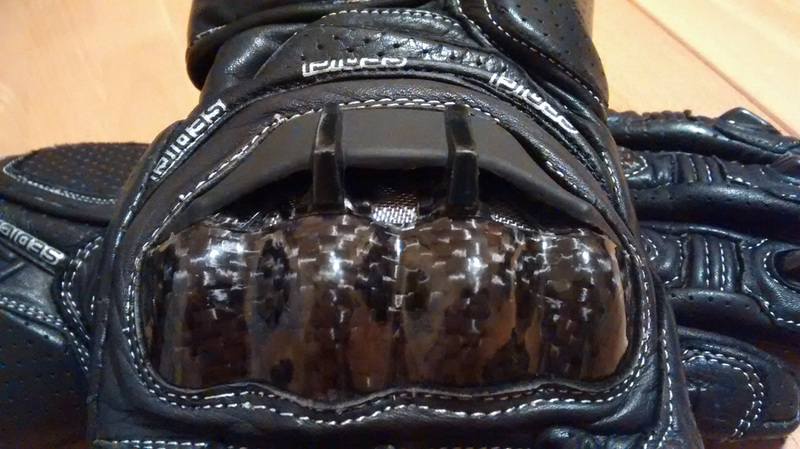 The gloves could benefit from padding in the heel of the palm to provide cushion against the grips. I find that my hand gets sore along this area on longer rides. The pre-curved fingers are comfortable, though I’m not sure how much difference that makes over non-curved fingers. Since the seams are on the outside, there is no irritating fabric rubbing against my fingers, which makes wearing the gloves for a long time (2-3 hours) comfortable. I will never, ever buy a pair of gloves with internal seams ever again. The difference in comfort is astounding. The Ultimo gloves are construction with full grain leather, and double layers in key impact areas. Your top knuckles are covered by a hard plastic guard, and each finger knuckle is covered by the same material. The pinky side of the glove is covered with an extra layer of leather and is double-stitched. My jacket’s sleeves are a bit short, so having the gauntlet cuff covers skin that would otherwise be exposed to the elements. The higher cuff also makes the gloves feel secure on my arms, and provides some support to my wrists. I can’t speak to how well they would perform in slide, and I hope I never have to; however, I think they would do a good job of keeping my bones unbroken and keeping my skin attached. 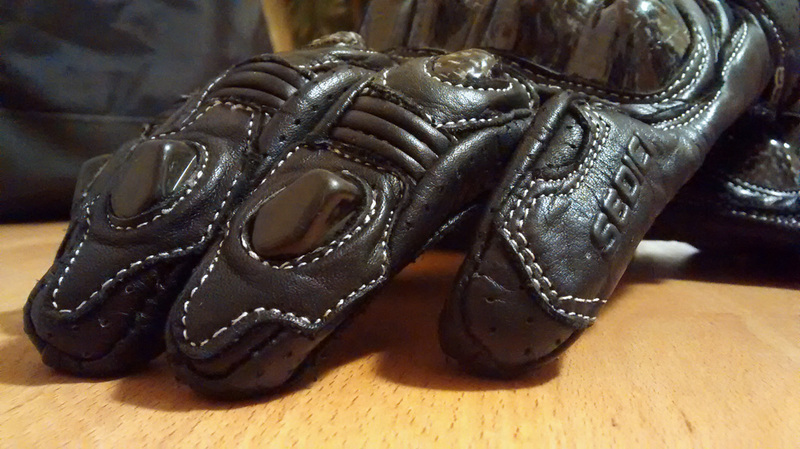 The perforated leather and knuckle vent allows quite a bit of air to flow through the glove. I expected to have hot, sweaty hands on super warm days, but to my surprise they stay fairly cool. The vents seem to be in all the right places. If I do feel my hands getting warm, I just splay my fingers into the wind and feel a good bit of air rush in. On extremely hot and humid (85º+) days, yes, my hands are hot and pink by the end of a 2-hour ride, but they aren’t sore or chaffed. On very cold days (40º-50º), the venting in these gloves makes them too cold. You can’t have it both ways. 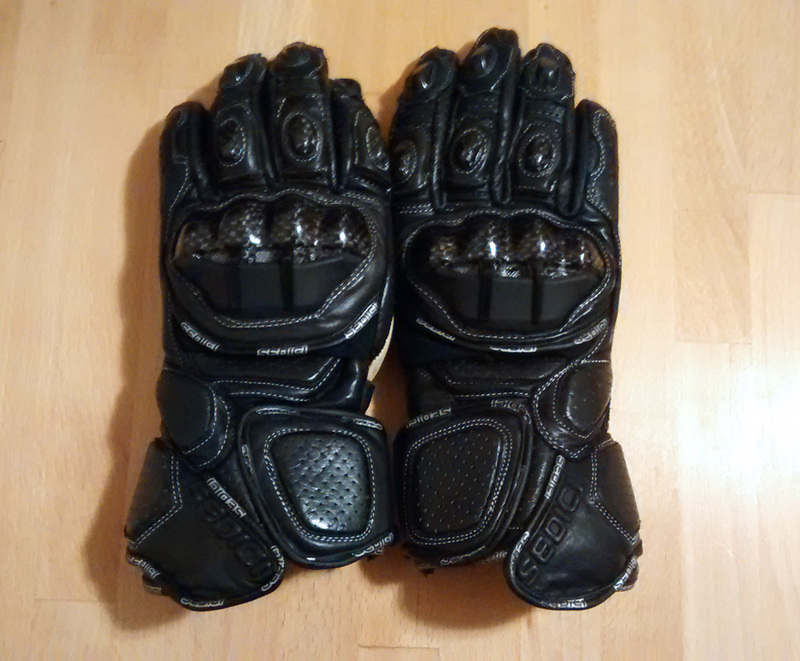 For my fair weather riding, these gloves are fine. For those colder rides, I just make it quick and wear a thin glove underneath. If you have the luxury of heated grips (I don’t), then none of this will matter. 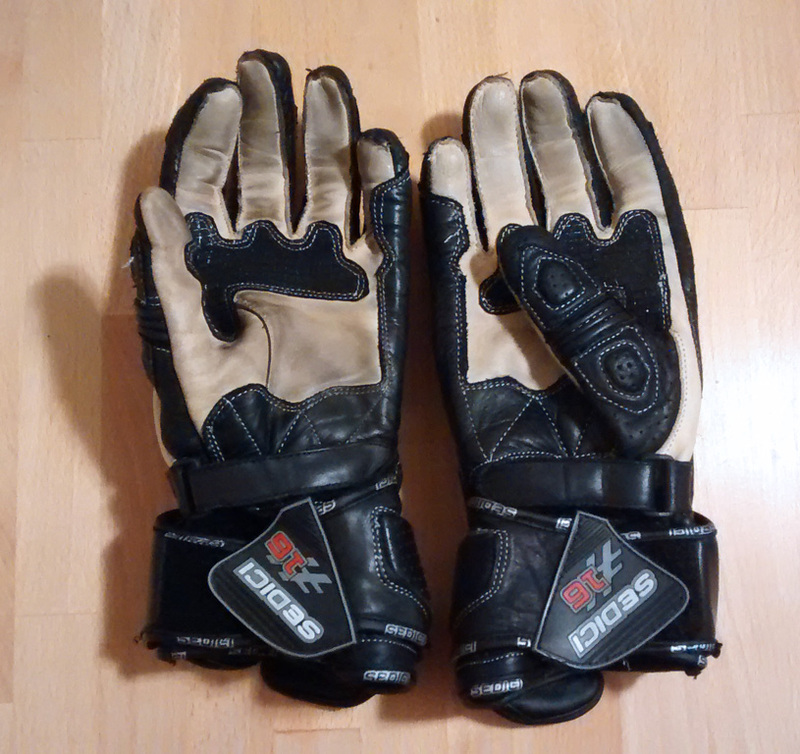 I’ve put about 1,500 miles on the Ultimo gloves, and they are holding up pretty well. The beige palm has been stained black from the dirt and grime of my hand grips, making them look a bit dingy. The velcro straps are still perfectly sticky and all the seams have remained in tact. The padding in the palm still provides a good amount of cushion. The gloves look worn, but not worn out. Since the gloves are backed by a lifetime guarantee, I expect them to be fairly durable, and they seem to be. 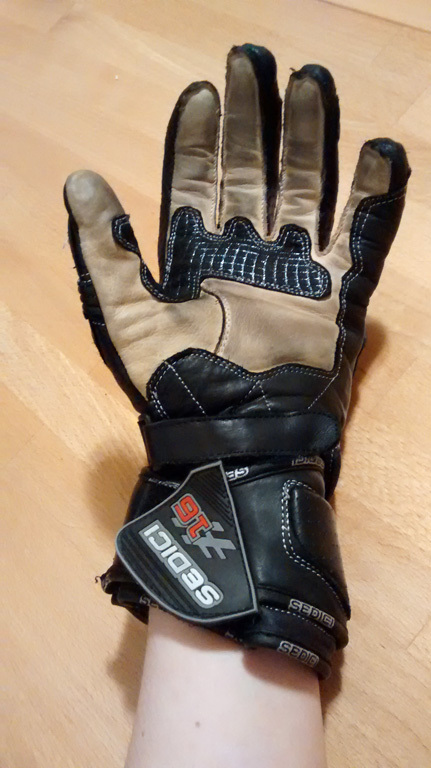 Overall, I’m pretty happy with the Sedici Ultimo gloves, and I use them on every ride. At the sale price of $65, I think they provide a very good value, especially with Sedici’s lifetime guarantee. I also like Joe Rocket gloves which are pretty value priced. Alpinestars are my personal favorite as far as fit goes, but they are a little more expensive. They do have closeouts periodically on older models which is when I tend to buy.